~ Initial breakdown of the skin-cerumen barrier (caused by presence of FB). ~ Skin inflammation and edema leading to subsequent obstruction of adnexal structures (e.g., cerumen glands, sebaceous glands, and hair follicles). ~ FB reaction leading to further skin injury. ~ In the case of alkaline battery electrochemical reaction, severe alkaline burns may occur. ~ History suspicious for FB insertion or witnessed FB insertion. • Some children may be asymptomatic. • Otitis externa—Presents with otalgia, otorrhea, and mild hearing loss, all of which can be present in ear FB. Absence of FB (on otoscopic exam) is the key differentiating factor. 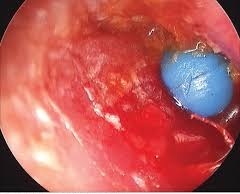 • Chronic Suppurative Otitis Media—Otoscopy shows absence of FB and presence of TM perforation; history reveals a chronically draining ear and recurrent middle-ear infections with or without hearing loss. Adequate immobilization of the child (sedation if necessary) and proper instrumentation allow the uncomplicated removal of many ear FBs in the pediatric population. • Ear FBs can be removed by irrigation, suction, or instrumentation. The type of procedure depends on the type of FB being removed. ~ Small inorganic objects can be removed from the External Auditory Canal by irrigation.  Vegetable matter—Irrigation causes swelling of the vegetable matter which leads to further obstruction.  Alkaline (button) battery—Irrigation enhances leakage and potential for liquefaction necrosis and severe alkaline burns. ~ Objects with protruding surfaces or irregular edges may be removed with alligator forceps under direct visualization. ~ Objects that are round or breakable can be removed using a wire loop, a curette, or a right-angle hook that is slowly advanced beyond the object and carefully withdrawn. ~ Cyanoacrylate adhesive (e.g., “superglue”) has been used to remove tightly wedged, smooth, round Foreign Bodies. ~ Live insects should be killed before removing them (by irrigation or forceps). Instilling alcohol or mineral oil into the auditory canal can kill them.